Lilian Constantini (1902-1982) was a French dancer and actress, before marrying industrialist Charles Schneider. During the silent film ear, she often worked with director Jacques Robert. French postcard by Editions Cinémagazine, no. 417. Photo: Sartony. Lilian Constantini was born Lilian Louise Hélène Chapiro-Volpert in Paris in 1902. She was the granddaughter of French Socialist politician Jules Guesde, and daughter of Boris Chapiro-Volpert, and Louise Bazile-Guesde. 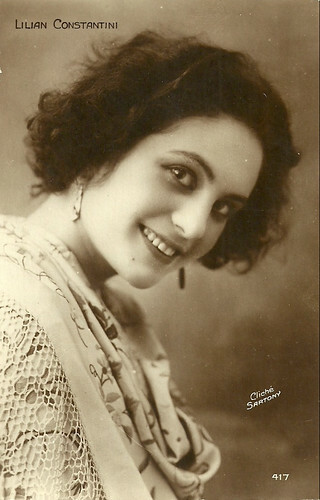 Her mother separated from Chapiro-Volpert in 1917 and remarried in 1924 with the - 18 years younger - Parisian film director and former actor Gustave Jacques Robert Kneubühler, better known as Jacques Robert. Constantini, only 7 years younger than Robert, was witness at the marriage. From 1921 she acted in a whole range films by Jacques Robert; actually, she acted in all of his films apart from Le comte Kostia/Count Kostia (Jacques Robert, 1925). Constantini debuted in Robert’s Gaumont production La vivante épingle/The living pin (Jacques Robert, 1922), starring Jean Toulout. In Robert’s next Gaumont film La bouquetière des innocents/The Innocent Flower Girl (Jacques Robert, 1922), Constantini already played a substantial part as Marie Concini, opposite the main actress Claude Merelle, who played the double role of Margot the flower girl and Leonor Galligalt. The third film of Robert and Constantini was the Honoré de Balzac adaptation Le cousin Pons/Cousin Pons (Jacques Robert, 1924), in which Constantini acted as Héloïse Brisetout opposite Maurice de Féraudy as Pons. In their next film, Naples au baiser du feu/Naples at the kiss of fire (Jacques Robert, Serge Nadejdine, 1925) Constantini had a major part opposite Gaston Modot and Gina Manès. After Gauthier Debere’s short La leçon bien apprise (1926), Constantini had the lead opposite in La chèvre aux pieds d’or/The Goat with the Golden Feet (Jacques Robert, 1926), adapted from the novel by Charles-Henry Hirsch and loosely based on the life story of Mata Hari. Toutcha (Constantini), a Russian girl, loses her anarchist lover to the Russian police – he is murdered. Forced by hunger she bends to police chief baron Friedrich (Pierre Alcover) and becomes a Russian spy while dancing ‘Ballet Russe’-style in Paris as ‘The Goat with the Golden Feet’. One day, by their mutual friend Ursac (Max Maxudian), she meets a French lawyer, Marc Brégyl (Romuald Joubé) and they fall in love. Happy to escape the clutches of the baron, she joins Marc to his country house, but out of boredom she invites her theatre friends, whose wild parties drive the lawyer to madness, so he breaks with her. Time after, he receives a letter from her. The First World War has started, Toutcha is arrested as a spy and she asks him to defend her. With all his powers he does so, but in vain. Toutcha will be executed. French magazine cover. Lilian Constantini in La chèvre aux pieds d'or (Jacques Robert, 1926). 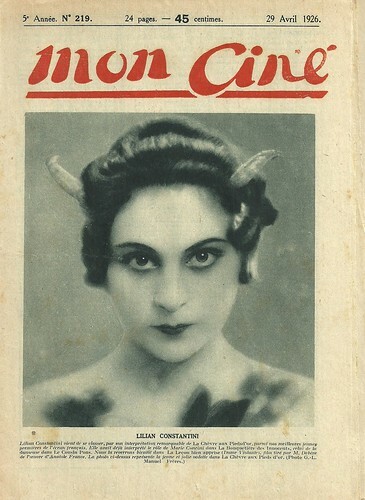 Cover of Mon Ciné, V, 219, 29 April 1926. Romuald Joubé. French postcard by Cinémagazine-Edition, Paris, no. 361. Lilian Constantini's subsequent film with Jacques Robert was again a spy themed story, En plongée/Diving, made in 1926 but released in 1928, with Constantini in the lead and with Daniel Mendaille and again Pierre Alcover as her co-stars. It was Robert’s last film. He would die in 1928, at the age of only 38. The film, based on the story Fragments d’épaves by Bernard Frank was filmed in Brittany. Other sources say it pretended to be Brittany but was shot in Monaco. In 1928 Constantini acted opposite Georges Vallée in Germaine Dulac’s film Celles qui s'en font. During a period of “discophillia” in France, Dulac made this musical film, intended to be shown with records. Celles qui s’en font was split into two parts, with each part presenting a short story to match one of two tracks. Both stories feature dancer Lillian Constantini playing a female protagonist shunned by society (a theme dear to Dulac) and fallen on hard times. In 1929, Constantini had the female lead in Chacun porte sa croix/Everyone carries his cross (Jean Choux, 1929) about a man who forbids his wife and child to go to church until misery happens. She again played the lead in a spy story by Choux, Espionnage ou la guerre sans armes/Spying or Unarmed War (Jean Choux, 1929), a romanticised depiction of the life of female spy Louise de Bettignies. Then followed another lead in Sa maman/His mom (Gaston Mouru de Lacotte, 1929). In 1930 she had the female lead in her first sound film, L'étrange fiancée/The strange fiancée (George Pallu, 1930), with Henry Baudin as a Caligari-like mad scientist. In post-production they had given Lilian such a strange voice, that people started laughing in the cinema and Constantini protested after the first night. After an interval of several years, Constantini had a regular lead in three adaptations of mystery dramas by Marcel Allain: Lui... ou... elle/Him ... or ... she (Roger Capellani, 1934), Vilaine histoire/An ugly story (Christian-Jaque, 1935) and Crime d’amour/Crime of love (Roger Capellani, 1935), always with Robert Ancelin and Lucien Arnaud in the male leads as the amateur detective and the professional policeman. Constantini’s last film was Jean de Limur’s comedy Le coup de trois/The three (1936), starring René Lefèvre. In 1943 Lilian Constantini/Volpert married industrialist Charles Schneider (1898-1960), cousin of filmmaker Germaine Dulac and heir of the biggest French steel and armaments factory Schneider-Creusot. After serving in the First World War he was fired from the family business in 1924, because of a conflict with his father Eugène Schneider II. He then worked at the Gaumont Film company, but in 1942 after the death of his father he took over the family business with his brother Jean. 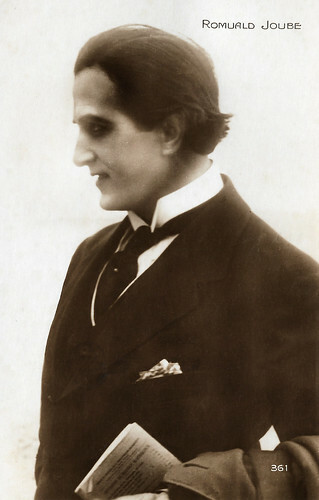 Schneider and Constantini had one son, who died early, but two daughters lived on: Dominique (1942) and Catherine (1944). Dominique became writer and named herself Schneidre. She published e.g. on her mother the book Fortune de mère (2001). Catherine Schneider was in 1975-1977 the third wife of filmmaker Roger Vadim, with whom she has a son, Vania Plémiannikov. 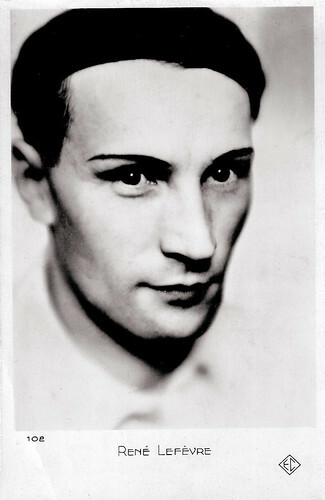 Lilian Constantini/Volpert/Schneider died in 1982 in Saint-Tropez, France. She was 79. René Lefèvre. French postcard by Éditions Chantal (EC), Paris, no. 102. Celles qui s'en font (Germaine Dulac, 1930). Source: Georgette 14 (YouTube). Sources: Unifrance, Rochelle Sara Miller, Wikipedia (French and English), and IMDb.